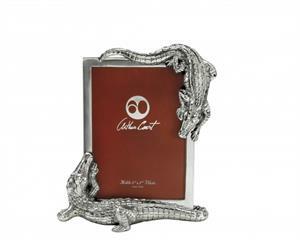 Stalk your favorite photo with the help of the hungry reptiles in Arthur Court's 5x7 Alligator Photo Frame. A nice complement to, but another alternative of our 4x6 option, this design features two alligators crawling on opposite corners of the frame. The lifelike detail in their swishing tails and scaly skin providers an intimidating border for this handsome, aluminum piece.